When it comes to defense, the only thing people seem to talk about with Gary Sanchez is his blocking. 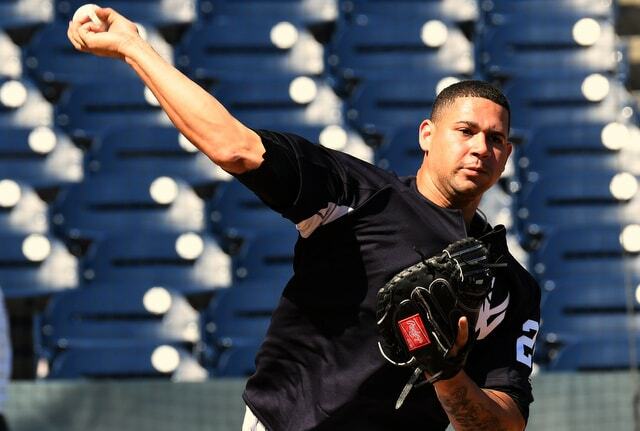 He’s not particularly good at it, but he and the Yankees are working on it, and hopefully Gary improves going forward. Me? I’ll live with a league-leading passed ball total given everything else Sanchez brings to the table, especially offensively. Sanchez’s best defensive tool is, clearly, his arm. He’s had a cannon since signing as a 16-year-old out of the Dominican Republic and nothing has changed. Gary has thrown out 39% of attempted basestealers in his big league career, and with throws like this, it’s easy to see why.
? What an arm. Sanchez has always had unbelievable raw arm strength, and he’s worked hard to improve his throwing technique, particularly his transfer. As recently as November 2015, Eric Longenhagen referred to Gary’s transfer as the “glacial way he rises from his crouch when he throws down to second base.” Ouch. Pop time — the time it takes the ball to go from the catcher’s mitt to the infielder’s glove on a throw to second base — has been a thing in baseball circles for decades, though aside from the occasion note in a Baseball America scouting report, we had no access to that information. Pop time was a big secret. Sanchez’s exchange — the time it takes the catcher to get the ball out of the mitt — is above-average but not top of the line. His arm strength compensates for the good but not great exchange and allows Gary to post a truly elite pop time. Last season only Austin Hedges (1.89 seconds) and J.T. Realmuto (1.90 seconds) had a better average pop time than Sanchez. A step up from “glacial,” I’d say. Even though Sanchez missed close to a month with his biceps injury, opponents attempted the third fewest stolen bases against the Yankees last season. Gary’s arm is so good that teams don’t test it all that often. Similar to an outfielder with a great arm, a catcher with a great arm doesn’t get to use it much, because other teams won’t even bother to challenge him. Opponents respect the hell out of Sanchez’s arm. Make no mistake, Sanchez will always be a bat first catcher, and people are always going to focus on the passed balls because people like to focus on the negative for whatever reason. Gary’s arm is as good as it gets though. It seemed that way to my untrained eye and the Statcast data backs it up. Sanchez has greatly improved his pop time since his prospect days and now he’s among the best in the sport at throwing to the bases.